Eco Majestic’s Rumah Selangorku Open Day has attracted 500 interested buyers to its sales gallery in Semenyih today, with some of them waiting since 7am to get the front place, according to the developer Eco World Development Group Bhd (EcoWorld). Eco Majestic general manager Evon Yap said the open day idea is a first for Eco Majestic as well as the property development industry. “We expected about 300 people to turn up, but instead, the numbers totalled as many as 500 and the crowd started queueing as early as 7am this morning,” she said in a press statement today. 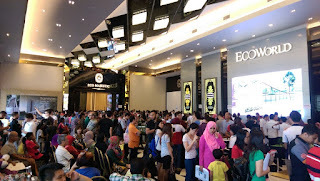 The objective of the open day is to provide a one-stop service for first-time homebuyers to cut down the waiting process for Rumah Selangorku applications, which normally takes about three months. “Interested purchasers can submit their documents and obtain on-the-spot approval to purchase apartments under the Rumah Selangorku scheme,” she added. Officers from government agencies including Selangor Housing and Real Property Board (LPHS), RAM Credit Information (RAMCI) and The National Higher Education Fund (PTPTN) were also present today to assist the applicants. She noted that amongst the 500 interested buyers who submitted their applications today, 300 successful applicants have also booked a unit in Simfoni Apartments. “The other 200 applicants who have failed today due to incomplete documents can submit their applications to us by next week and we will deliver their applications to LHPS for approval,” she added. Simfoni Apartments comprises three blocks of 11-storey residential towers which house 870 units of freehold apartments with built-up size of 750 sq ft. The selling price is RM100,000. Launched in September last year, Simfoni Apartments' construction has started in early this year and it is slated to be completed within three years. Meanwhile, EcoWorld president and chief executive officer Datuk Chang Khim Wah said with this initiative, the developer hopes that the first-time experience of buying a property would be more than pleasant and a breeze. “We are delighted to be able to do this for our interested purchasers who want to make Eco Majestic their new home. It is also an EcoWorld initiative to reach out to first-time homebuyers,” he added.